Quite recently a friend of mine was hired to perform a very important job. He had to run up stairs, jump over buildings, swing through trees, and read the following comic book created by Charles Soule, Stefano Landini, and published by Marvel in February, 2018. I’m not sure why though. He was only hired to be an accountant. TO QUOTE Michael Corleone: 'Keep your friends close but your enemies closer'. 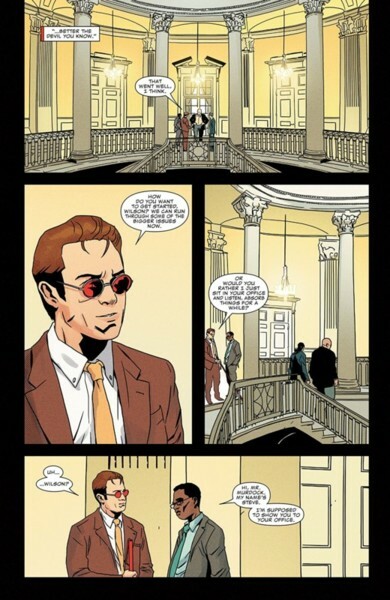 Can someone please explain to Foggy Nelson why Matt Murdock agreed to be Wilson Fisk's new Deputy Mayor? After all, they don’t like each other, they don’t agree with what the other one stands for, and let’s not forget that these two men have secretly been at war for many-many years. Worst still, Wilson has recently offered a huge reward with the intent of encouraging the general public to aide the police in capturing Matt’s alter ego, Daredevil! So what does he do next? Matt I mean. Does he just bide his time by spying on Fisk from his office? Or does he get up close and personal and try to take him down the good old fashioned way? Namely, with a fist in the face! Part One) THIS IS GOOD: First off, please allow me to say that I really enjoyed reading this issue of Daredevil. Not only was it beautifully illustrated, fun to follow, and complemented with a sublimely suspenseful story-line, but in addition to this, it also posed so many questions I can’t wait to see them getting answered! Well, let’s face it, what is Matt playing at by agreeing to be Wilson’s new Deputy Mayor? Did he just accept this role so he could be in a good position to spy on him? Or does he have something else up his sleeve? 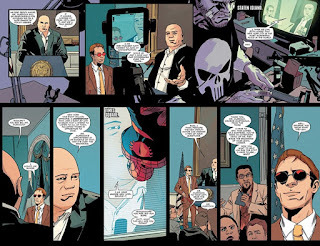 Say, a plan where he joins forces with some of the other heroes who populate New York, such as Spider-Man, The Punisher, or Iron Fist, so they can each instigate a sneak attack from behind Wilson’s back! After all, some of them have made a number of small cameo appearances over the last few months, so it only stands to reason that their inclusion means something within the bigger picture. 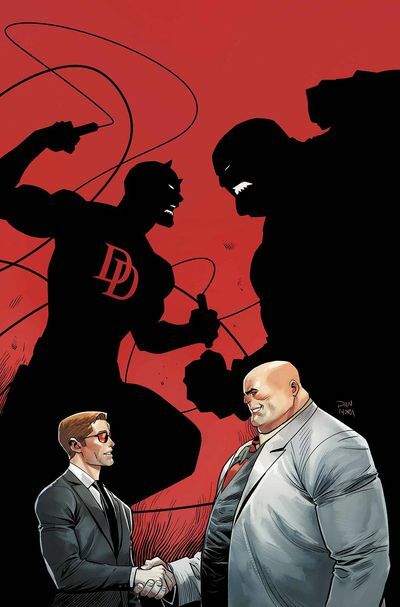 Also, what about the main man himself: Wilson Fisk? Why did he deviously offer Matt this job in the first place? To constrain him? Most certainly! But what else? And how is any of this connected to the Sarnos Project? (Whatever that is?) What's more, now that Muse has been thrown into the mix, will his inclusion tip the scales in either direction? So do you see what I’m trying to say now, dear reader? Don’t you think that this story throws around a lot of really exciting questions? In fact, they’re so exciting, that I’m starting to wonder if Matt will use his current position to find a new political role after loosing his job in the DA’s office (as insinuated by Foggy). Oh! Now wouldn’t that be a turn up for the books? Mayor Fisk being replaced by Mayor Murdock? It has a nice ring to it, doesn’t it? Part Two) HOLD IT IN: You know that feeling you get when you want to go to the toilet but can’t because there isn’t any appropriate facilities nearby? Well, it isn’t a very nice feeling, is it? As it can make you feel quite emotional, because you have no other choice but to clench, tighten, or tense the appropriate areas just in case an unfortunate incident occurs. Plus to make matters even worse, the longer you hold it in the more terrible you can feel, and this will go on, and on, and on... and on, until eventually, Boom, Mother Nature will pay you a visit and you’ll have to change your clothing. Now try to re-imagine that scenario but without the Boom, and if you can do that, then you’ll have a pretty good idea of how I felt about this very issue. No. I’m not trying to say it was so scary that I sh*t myself! What I’m trying to say is that this story was so suspenseful I had to suppress my own emotions despite the lack of release. A good example of this can be seen in that great sequence where Daredevil tried to stop a gang of crooks from robbing a grocery store. At first I was very curious to see him back in action again. Then I was happy because I saw him take down the crooks in question. 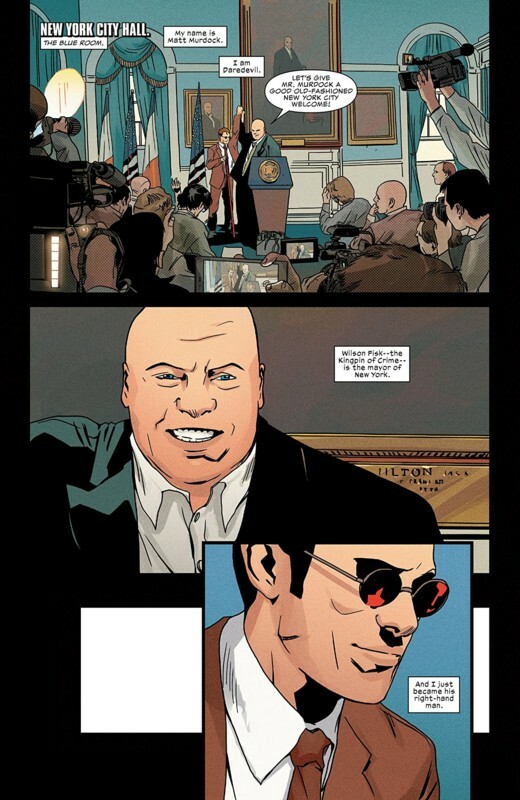 After that I became concerned because the owner of the store pulled a gun on Daredevil in order to cash in on Fisk’s reward. And finally I was surprised when McGee showed up and told him about Muse. I could also say the same thing about that sequence where Matt was trying to eavesdrop on Wilson, doing so while he kept on being interrupted by the likes of Steve as well as work in general. So, do you see what I’m trying to say here, dear reader? This story plays around with our emotions, in a good way of course, by presenting us with an exciting plot, an exciting future, as well as a cast of some really exciting characters. Oh! And while I’m on the subject of exciting characters, I must say that it was really great seeing Foggy Nelson again and I do hope he can stick around. And as for Muse, well, what can I say about him? Nothing much really! Nothing except for, Wow!, how will Blindspot react to that? Not so good, I’m sure. Part Three) NEON METROPOLIS: Last month I praised Stefano Landini because his illustrations worked so well with the story being told. And do you know what? I’m going to do exactly the same thing again. After all, it would be rude of me not to! Ha! Although, come to think of it, the one thing he does do differently this month is to subdue his facial expressions and make things flow more naturally on the page. Take the first few pages for instance, or to be more specific about it, the first ten pages which feature Matt interacting with the likes of Wilson, The Press, Steve, as well as Foggy. Well, if you look at these panels more closely, you’ll notice how Stefano underplays his illustrative style in both the foreground and the background. I personally believe that he does this so we can concentrate more on the dialogue being spoken rather than a flashy picture being displayed. Don’t worry though, because he reverses this technique when action becomes a priority, such as in the fight scene set in the grocery store, and goes to show how both pictures and words can harmoniously work together in order to complement a story’s initial intent. Now something else I would like to mention would have to be Matt Milla’s tonally appropriate color pallet. Like Stefano, he also has the good sense to know exactly when he should overplay or underplay his hand. This can be seen during the aforementioned action scene (especially with the neon glow emanating from a local street sign) or in a more conventional dialogue driven scene (which he usually desaturates with light pastel shades and hues). So all in all, this current creative team is doing a great job on this book, including you, Charles Soule, and I can’t wait to see what they have in store for us next. For a change of pace I thought I’d allow Matt Murdock to choose this month's musical match up. After all, he did inadvertently declare the name of a very appropriate song near the start of this book. So with that in mind, please take it away, Kylie Minogue, with your 90s pop ballad, ‘Better the Devil you know’. 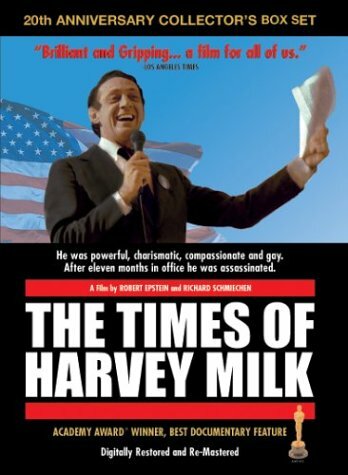 Have you ever heard of Harvey Milk? He was the first openly gay elected official in the history of California, until he was assassinated by another city official because of his sexual orientation. Rest in peace, Harvey, and comparison made, albeit a very conceptual one. John F Kennedy: Ich Bin Ein Berliner. Winston Churchill: Where’s My F@cking Cigar? Donald Trump: My Hair is Real. Margaret Thatcher: My Hair is Real Too! Ronald Reagan: It’s Bedtime For Bonzo. Adolf Hitler: War, Oh, Good God, What is it Good For?